We had a meet up at a neighborhood park which was adjacent to a Saturday farmers market. We had about 15 electric vehicles in attendance including 2 motorcycles. A lot of people from the neighborhood walked down to look at cars, talk to owners, and take test drives from the 2 dealers who had brought a BMW i3 and a Nissan Leaf. Most of the cars in attendance were members of the Bend Electric Vehicle Club. The members of the Bend Electric Vehicle Club are celebrating National Drive Electric Week with two Ride & Drive events! 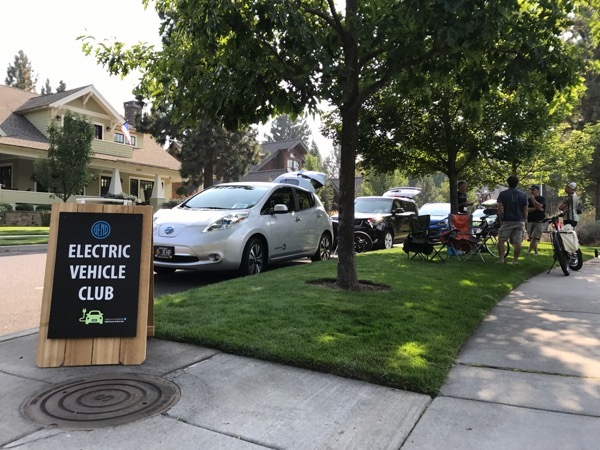 On Sat Sep 9 the Bend Electric Vehicle Club will be in Northwest Crossing and parked along the street on the south side of Compass Park. We'll have a variety of electric vehicles and their owners there so the public can look at electric vechicles, ask questions of their owners, and maybe even go for a drive! Our planned lineup of electric cars will include the BMW i3, Volkswagon e-Golf, Kia Soul Electric, Tesla Model S, Nissan Leaf, and Chevy Bolt - plus, a Zero FXS electric motorcycle. Note: The Northwest Crossing Farmers Market is happening that same day from 10A-2P, and we'll be 2 blocks down the street from 9:30A-4P. Our second Ride & Drive event will be at Pine Mountain Sports on Thu Sep 14 from 4:30P to 7:30P. If you are interested in bringing and showing your personal electric car at either of these events please, register by clicking the button at the top of this page, and contact Henry Abel at 541-525-1997. We'd love to have you there! Registered attendees report 132,516 electric miles driven.